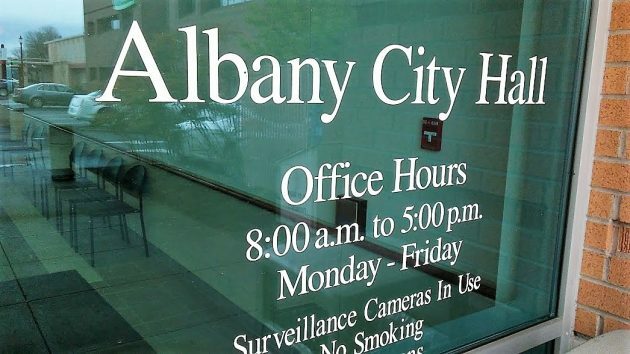 With the support of Mayor Sharon Konopa, Albany officials are working on a “public outreach” campaign that may lead to council action on a surcharge on city utility bills to raise money for street repairs. The subject came up at the conclusion of the city council meeting Wednesday night. The mayor brought it up, recalling that Albany voters in May 2018 overwhelmingly rejected a local city gas tax to pay for street work. There had been talk of a “street utility” tax as an alternative if the gas tax failed. The mayor wondered where that was. Jeff Blaine, in charge of community development as well as public works engineering, responded that the staff had been working on a public outreach campaign including video presentations in preparation for bringing a proposal to the council. A similar campaign to win public acceptance was launched in 2016 before the council enacted a storm water utility fee (I’ve been calling it a rain tax) that has been added to the monthly city water and sewer bills since March 2017. Councilman Bill Coburn served notice that he would oppose a street utility tax. He is opposed to another tax as long as the city continues to divert about $1.5 million in annual franchise tax receipts to other city programs. The franchise fees on city utilities were originally enacted to support the street program but were sidetracked to shore up the rest of the budget during the recession about a decade ago. The street tax would be added to water and sewer bills the same way as the rain tax, which raises money for repairs and management of the city’s storm sewers. The defeated gas tax had been estimated to yield about $1 million a year, so you can expect any utility tax to cost about the same. More than 30 cities from Ashland to Wood Village, including Corvallis and Philomath, have imposed street utility fees, according to the League of Oregon Cities. The story has been edited to reflect this. Sounds like taxation without representation. Where does it end? Local governments imposing fees/taxes without voter approval were the subject of two recent ballot measures. Unfortunately, the measures were withdrawn. Our taxes are high enough. We are opposed to additional taxes and pro money management with what is already provided by the tax-paying community. Dose the Mayor and staff think money just grows on trees? Maybe they should look at the number of staff and all the programs they are supporting before starting another tax. The gas tax as I recall was defeated pretty strongly, why would they think we would support another tax! Until the voters exercise their voice at the polls and vote out this “tax and spend” Mayor, things will continue as they have. Thanks Hasso for keeping the public posted, even if they continue to make bad choices in elected officials. We have met the enemy. She, or he, is us! Looking at voter totals for the midterm election, it seems Albanians can’t get enough of voting against their self interest. Seems contrary to ordinary. Al Sims, amen! I’ve done my part for years, and educated my children on this very issue. Other than possibly canvassing, educating the gp just before elections I can’t think of any new options. This sounds like the perfect solution for the largely conservative Albany streetscape. People of a similar political philosophy as proffered by Hering and others in this blog should be excited about a Street Utility Tax. Remember that the folks on the Political Right are always championing pay-as-you-go. The Rightists always tout their belief that user-supported systems, such as roads, should be paid for by those that use them. In this instance, Conservative Albany residents are the primary users of the public roadway. As such, Albanians should be fully supportive as to the care and feeding of Albany roadways. Anyone on the Right who objects to this Street Utility Tax is (1) willfully ignorant of their own beliefs, or (2) are simply cheapskates who want to drive on public avenues without paying for the maintenance. Get behind this tax and be proud of Albany’s roads again. Bill Coburn makes absolute sense. Stop diverting the original funds. On many political issues representative government serves “the people” well. But when representatives want to impose a tax without taxpayer consent, tax tyranny is the result. Albany taxpayers should immediately right this wrong. Contact the Mayor and Councilors. Demand that Albany voters be the final voice on this new tax. Long term, Albany taxpayers should change the city charter via the initiative process to codify voter consent before new taxation. … or cover the potholes with the annoying and unnecessary street signs that remind us to buckle up and not text. Albany seems to have moved from a working mans town to a tax everything and spend town. Increases on already to high taxes, brilliant. True. Your individual taxes changed not a whit when that happened. It helped get the city through the recession by spreading income across several departments. Bill says he “understands” the conundrum of doing a clawback as it will affect those departments. Currently the city manager has been tasked by council to increase the very-low reserves – not to do a clawback of diverted funds. I agree with Bill Coburn. If franchise fees originally slated for road repair have been used else where, then there is a problem. It appears the city’s budget is wonky. We should not be taxed to replace funds that were diverted to cover short falls in other money buckets. Does the City ever stop and consider than many of us only get cost of living increases in our income. It seems every additional tax/fee they impose/increase is several times our “raise”. This is slowly forcing us underwater. It’s hard enough to come up with enough money to just maintain our homes. Extracting more just turns “adequate” houses into derelicts. CARA has…..what……about $25,000,000 left to spend? That, along with existing city funds, would fix a lot of downtown roads. Not sure what to do about the rest of Albany, but hey, some parts of Albany are more equal than others. Just ask the Mayor. As I read this woeful litany of the disaffected regarding their opposition to the idea of paying for roadway maintenance, I am struck by this curiousness. The persons who don’t wish to pay are nearly indistinguishable from those who routinely complain about the roads in Albany. Where I come from, that incongruous dichotomy would be defined as hypocrisy. Additionally, this proposal seems to fit the Conservative/Libertarian bent in this neck of the woods. A road-tax simply shifts a bit of the cost of maintenance to users. Conservative/Libertarian usually glom-onto ideas like Toll Bridges. This tax is really no different. If you don’t want to pay for the roads, then quit your whinging. So kind of you to stop by and lecture folks on just how very wrong our opinion is! It’s bout diverting street repair funds to “other” city projects. It’s about spending money on stupid stuff like “promenades”, stupid overhead street lights & back in parking while a couple blocks away and beyond the streets are crumbling. Money spent that could have been used for preventive maintenance that could have saved us $1000’s on street repairs if it hadn’t been squandered on the mayor and her elitist city council cohorts that want a nice street where THEY work. Damn to the rest of the “peasants”. Bill Kapaun, I wholeheartedly agree and think your post is spot on. The voters spoke when we rejected the gas tax but they’re not gonna let that stop ’em. The City is gonna take your money regardless. The gas tax would have at least meant those who were using the roads most would be the ones paying most. With a utility tax you get to pay even if you don’t own a car. Ironic that the city will spend money taking the county to court to try block someone from building a home outside the city limits, but they have no money for infrastructure. *ENGAGE* with your councilor (whomsoever the may be)! Not just once, but on a regular basis. .Get involved! Offer solutions – not simply emotional whining and complaining..